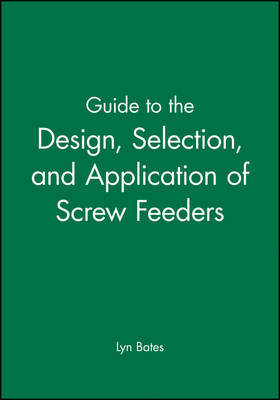 Guide to the Design, Selection, and Application of Screw Feeders was initiated by the Department of Trade and industry under the auspices of the British Materials Handling Board, who perceived a very real need for a practical guide to designing, selecting, and using screw feeders. It offers the reader clear and accessible advice - whether seeking a standard screw feeder for a well-proven application, or designing from scratch for a new duty where no prior experience can be drawn upon for performance verification. Screw feeders today play an increasingly important role in the drive towards improved quality, reduced costs, increased capacity, better working conditions, and flexibility in solids processing. Solids feeding operations are a key industrial activity, but are renowned for operating difficulties that are quite unrelated to the capital cost of the equipment. Accurate, reliable performance of gravimetric feeders can both improve the quality and consistency of a product through close control of ingredient materials and offer impressive savings through reduction of 'give-away' or 'over-delivery' of product to filling machines. Clear and well structured Has international appeal Practical - drawn from experience Well illustrated Offers solutions to real problems This Guide offers invaluable information to industrial companies that process and handle bulk materials and to equipment manufacturers - including design and process engineers, plant and production managers, and maintenance engineers who are seeking to optimize performance of production plant. Lyn Bates is an internationally recognized expert in the field of bulk solids handling and particularly screw feeders. He is Managing Director of Ajax Equipment Limited, a company that specializes in screw-type equipment for solids handling. He is a member and past chairman of the Institution of Mechanical Enginners Bulk Materials Handling Committee and has published many papers on subjects ranging from powder test devices to developments in solids storage and handling.